My family goes through a lot of composition style notebooks. Both my kids prefer them for the games and stories they are working on, and to keep notes in. I use the mini ones to keep notes in and for shopping lists and reminders. They cost a lot less than blank books and have nice smooth lined paper. We also decorate them in different ways which makes less likely we will grab someone else's book. They are also great blank canvases for personalizing. The miniature composition books are 4.5 inches tall by 3.5 inches wide and have 80 pages, or 160 if you use the front and back of them. For my purse, I prefer a way to close them, and a bookmark to find the page I'm on quickly. Work with small puddles of Mod Podge. Only as much as you'll use for each step. Start by tracing the notebook on the back of your main color of paper. Then draw a second line a half inch away from it on 3 sides- 1 long and 2 short. Cut it out, then use that piece as a pattern for the second piece. Use the Mod Podge to affix the paper to the outside of each cover. Diagram shows how it looks on the inside. Trim the corners at a 45 degree angle, then lightly score the paper as close to the edge of the notebook as possible. Fold in edges, and glue down with Mod Podge. Let it dry for 20 minutes, then cover one side with Mod Podge. Let that dry for 20 minutes, then cover the other side with Mod Podge. Let it dry for 20 minutes. Now you'll attach the elastic. Punch a hole in the back cover, centered vertically and about an inch from the outside edge of the notebook. Cut 6 inches of elastic, seal the ends with just a dab of Mod Podge, other glues will work, but the Mod Podge is right there! Then make a small cut a half in from each end. Make a loop with the elastic, and slide the brad into both slits, then through the hole in the cover. Open the "legs" to affix it in place. It will slide over the notebook to keep it closed like below. But for the next part you need to be able to open the book, so slide the elastic off the front cover again. Cut 2 sheets of the contrast paper to fit the inside covers and glue them into place. Now you'll need to make the book mark. Take a piece of floss about 16 inches long, and thread the charm on it, match up the ends, then tie a small overhand knot above the charm in the middle of the strand. Cut a piece of contrast paper that's 3 inches wide by 4.5 inches tall. This is a good place for decorative scissors for the long edges. Put the bookmark in so the charm hangs out just a bit from the bottom, fold the top part of the floss over the spine, and glue it down. Now glue the contrast paper over the spine. Let it dry for 20 minutes, then go over the cover with more Mod Podge, let that dry for 20 minutes, and put on another coat of Mod Podge. Work around the brad and elastic on the back cover. Let it dry completely, slip the elastic over the cover, and it's ready to go! These make wonderful little gifts too. Other than drying time, they are very quick and simple to make. You can further personalize them using photos, stickers, and paper cutouts on the covers. 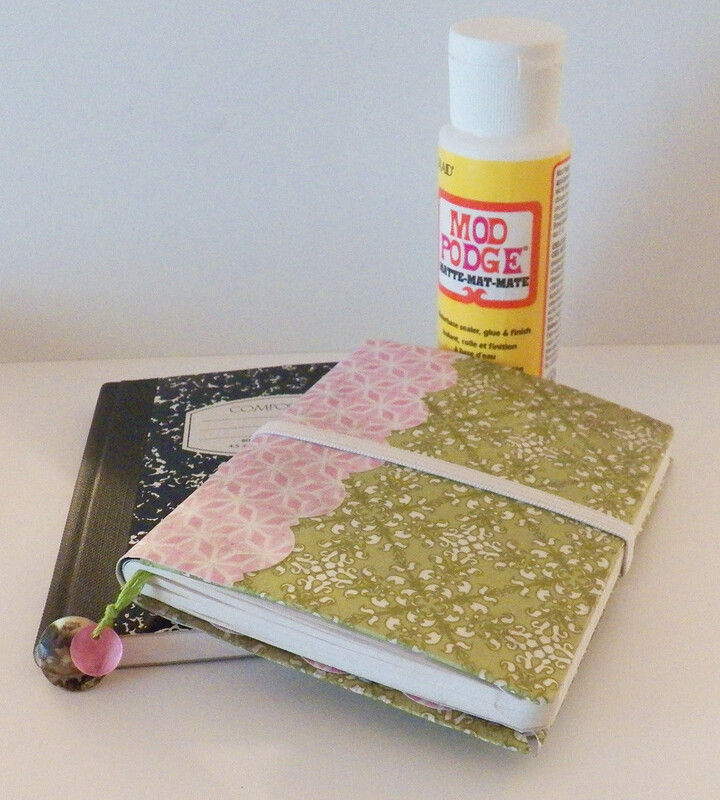 Plaid sent me the Mod Podge Starter Pack at no cost to use for projects on Don't Eat the Paste. Be sure to like them on Facebook for lots of links and ideas. The starter pack has 2 ounces bottles of Mod Podge Sparkle, Mod Podge Matte, Mod Podge Gloss, Mod Podge Outdoors and Mod Podge Paper.